I feel like I’ve lost a bit of focus over the last fortnight or so, when it comes to my sewing. Not helped by the fact that Toddler Boy infected us all with another vicious flu-like bug from nursery. Hubby has been ill and in bed for the best part of a week, Baby Boy is now hopefully through the worst of the coughing-and-fever stage, and I’m waiting to see whether mine will get any worse than this currently manageable cough I have. It’s been kind of a tiring couple of weeks. But I’m back to work next month so feel like I need to cram in as much sewing time as possible in the next three weeks. So I got halfway through a muslin toile for my modified Colette Laurel dress, but seem to have lost the motivation to figure out a new sleeve pattern to fit the adjustments I had to make to the bodice of the dress. I decided, once I realised I’d have to draft a new sleeve, to invest some time in creating a set of slopers/blocks for myself so that at the very least I can have a good template for the sleeve and armscye areas to hopefully help in situations like this on future patterns. I had two options here: I have actually purchased the basic sloper patterns from Burda, but I also bought a book on freehand drafting because I liked the sound of not having to stick together lots of pieces of paper to get started :). 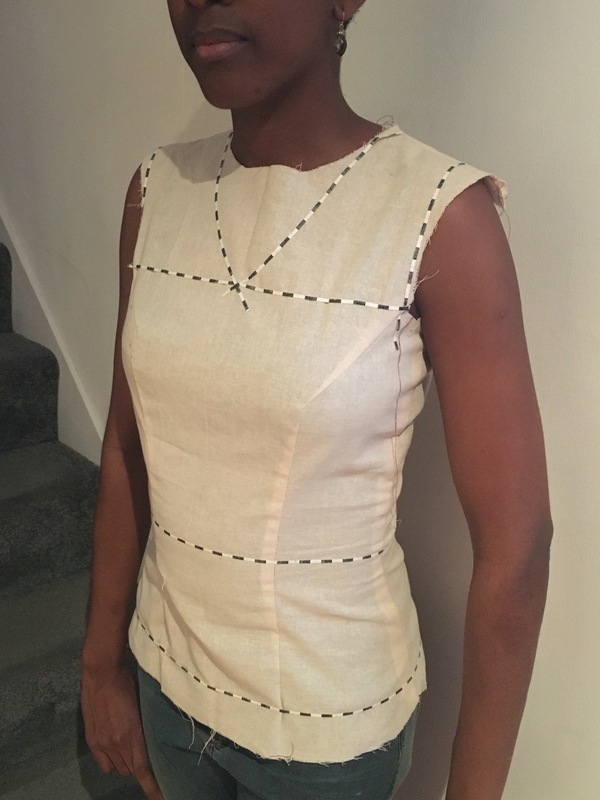 I’ll do a separate post on the making of my slopers but for now let’s just say I’ve now got a bodice which still needs a few more fitting tweaks, but is mostly there, and I’m lacking motivation to sort out a sleeve for it… Sound familiar?! So a couple of nights ago I decided to try and get a quick sewing project out of the way. I printed out, assembled and traced my Sew Over It Silk Cami pattern, a simple cami/tank top which is now ready for me to cut fabric for, and sew. But I’m strangely unmotivated to do that either! I then found myself thinking, maybe I should just spend some time preparing the next few patterns that I want to sew, so that I can then have one big sewing day.. But then it’s back to fitting on a per-pattern basis so maybe I should finish off the slopers?! It’s like I’ve got so little ‘me’ time left before work, and I’m so tired, that I can’t seem to get in the zone .. So I’m really hoping I can snap out of it soon because it would be nice to get on with some ‘making’ again, we’ll have to see how it goes..
← (Part 2) Stashbusting plans for 2016..